I was searching for a control box to fit my MKS GEN L, Raspberry Pi 3B and a Buck Convertor (LM2596). Plus, I wanted to be able to still easily connect a usb cable to both the MKS GEN L and the Raspberry Pi. I did not find such a box, so I decided to create it on my own as my very first fusion360 project. While I was at it, I decided to incorporate a cable chain connection for the heated bed. 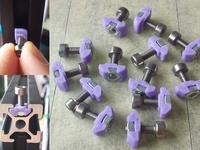 It replaces the cableChain_40MountSide from the cable chain at https://www.thingiverse.com/thing:2920060. You can now connect the cable chain directly to the control box. 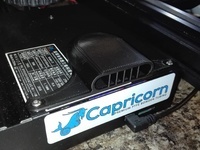 The left control box also holds an opening in the bottom to feed through a cable to the PiCam. This is the result. Have printed and fitted it myself. All fits snugly. 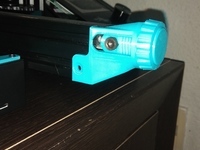 Some Ender-3's have the connection for the stepper motor cable on the bottom, in that case you will have to unscrew the stepper motor and turn it so the connection is at the back and doesn't get in the way of the cover. Covers can hold a 40x40x10 fan. 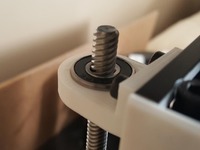 Mount it with M3 bolts and nuts.